Mehta Steels has experience of supplying ‘Crane Rails’ like CR 80 , CR 100 , CR 120 to various prestigious projects and companies around the world such as material handling , power projects , port and logistic projects , steel mills , sugar industries , engineering projects , etc. Mehta Steels provides complete know how of the Crane Rail Profiles of both Indian as well as International origins. We maintain stock of Crane Rails OF Indian Origin manufactured by SAIL & JINDAL STEEL & POWER LTD.
Mehta Steels is Pioneer in Stockholding of Crane Rails manufactured as per Indian Standards The Crane Rails supplied by Mehta Steels of Indian origin confirms to IS standards. 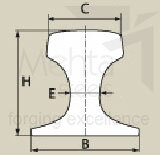 Mehta Steels can also supply Rails Confirming to IS 3443 standards. Mehta Steels Supplies Crane Rails of European Profiles from the best mills. These Profiles are manufactured according to the European standards the range of tensile strength of this profiles range from 690 to 1080 N/mm2. The standard lengths of European Crane Rail Profiles range between 6 to 11.8 Meters when shipped by containers when shipped in special conditions maximum length up to 24 Meters can be supplied. Mehta Steels supply European profiles in steel grades matching to various qualities and specifications as per clients requirements. Crane Rail Profiles are supplied in accordance with ASTM Specifications which are used for standard carbon applications or head hardened to provide greater wear ressistance and fatigue life. The standard lengths of American Standard Crane Rail Profiles is 11.8 Meters when shipped by containers when shipped in special conditions length of 18 and 24 meters are standard other length can be considered on special requests.